传记: Spanning a history of 2000 years, China¡¯s ancient Buddha sculptures and fresco still charms the world with their excellence, beauty, and unparalleled artistic value. They are considered the world treasure, possessing artistic, religious, historical and social values. 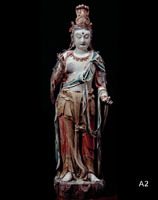 Reproducing the thousand-year old relics has presented unimaginable challenges and a breakthrough both in art and in aging process must be reached. However, just several years ago, two young Chinese Mr. Yang Gang and Mr. Yang Mingyang devoted themselves into sculpture and fresco field respectively and have overcome the technical obstacles both in artistic aspect and in process aspect. Experts predict that within the next five to ten years, they will be able to pioneer these two fields. Mr. Yang Gang, a former violinist from Shanghai Broadcasting Orchestra, is infatuated with China¡¯s ancient art. In 1996 in Great Britain Museum, he sparkled the idea of reproducing China¡¯s ancient Buddha sculptures after he saw a piece of China¡¯s ancient Buddha sculpture. Then he found his partner, Mr. Wang Gang, a talent from China¡¯s Central Culture and Art Institute. They spent days and nights working on the aging process of sculptures and after they gained certain progress, they made investment and incorporated the business entitled Ancient Myth. The motto of Ancient Myth is to recover the original simplicity of the ancient sculptures by hand-made craftsmanship. Ancient Myth has ever since gathered many top-notch sculptors to ensure the quality and artistic value. In the process of aging, in order to reach the most satisfactory looks, numerous experiments on materials and methods have been completed. Such process is time-consuming and very costly. Today, Ancient Myth has about 50 artists. The finished reproduction of Buddha sculptures each month could vary from 4 or 5 to the most 10 pieces. The reason behind this limited quantity is 16 processes have been strictly observed and even the smallest flaw will result in remaking of the sculpture. Due to the strict quality control, making a profit has ever since become a task that is hard to be fulfilled. Mr. Yang Mingyang used to be a member of the international renowned Chinese rock-and-roll band entitled ¡°Tang Dynasty¡±. From 1984 to 1988, Mr. Yang studied at China Central Culture and Art Institute. During his college years, his oil painting ¡°My Sun¡± won the third prize in China International Young Artist Work Exhibition and the painting is collected in China Art Museum. In 1991, Mr. Yang started to compose words for songs and participated in the first album entitled ¡°Dream returns to Tang Dynasty¡± by band ¡°Tang Dynasty¡±. Between 1992 and 2000, he settled down in Italy and started to create water and ink painting and oil painting, meanwhile he was involved in repairing frescos, through which he mastered the traditional Italian wet-fresco technique. In 2000, he returned to his home country China and set up his own workshop ¡°Mingyang Fresco Art Workshop¡±. The primary targets for his work are the most famous frescos in Dun Huang city and Yong Le Palace (Palace of Eternal Happiness). In the next year, his initial batch of work of reproduction of China¡¯s ancient frescos was exhibited in Shanghai Art Exhibition and caused a sensation during the show. One year later, he held another exhibition in Beijing International Art Museum. Initiated by the love and passion towards China¡¯s ancient art and culture, Mr. Yanggang and Mr. Yang Mingyang challenge one common goal: achieve perfection in reproduction and represent the ancient treasures.